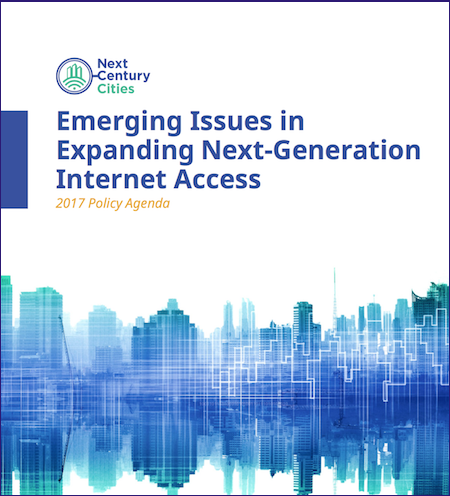 Next Century Cities’ “Emerging Issues in Expanding Next-Generation Internet Access: 2017 Policy Agenda” offers recommendations to local communities that want to improve and expand local connectivity. This policy agenda looks at some of the most recent issues facing cities and examines ways they’ve faced the challenges. Many of the examples in the policy agenda come from communities that are members of Next Century Cities. A new case study recently released by the Berkman Klein Center for Internet & Society at Harvard University describes how the community of Concord, Massachusetts deployed its extensive municipal fiber-optic network and smart grid. 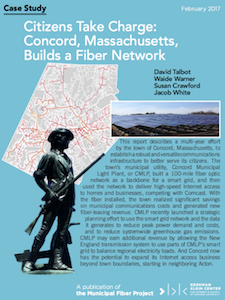 In Citizens Take Charge: Concord, Massachusetts, Builds a Fiber Network, the authors offer history, and describe the benefits to the community from better connectivity and enhanced electric efficiencies. As federal agencies examine the AT&T - Time Warner merger, how we analyze antitrust also needs to be reevaluated - especially in the telecommunications industry. A new report from the Roosevelt Institute takes a closer look at how antitrust enforcement philosophy has changed and how that change has enabled the current state of telecommunications in which a few large anticompetitive players control the market. The authors offer recommendations and cautionary predictions that may arise if we continue without reassessing how we scrutinize these large scale mergers. The report notes how scrutiny of mergers has come to depend on the perceived harm the results will have on consumers, but such a narrow focus results in harming competition. Instead, regulators should adopt a more holistic view of market power, specifically incorporating analysis of upstream impact of anticompetitive behaviors, especially those enabled by mergers. This would entail closer scrutiny of vertical mergers, positive price discrimination, and non-price-based schemes to profit excessively by withholding access to consumers. A growing number of U.S. cities have broken up monopoly control of the Internet marketplace locally. They're promoting entrepreneurship while giving residents and businesses real choice in how they connect and reach new audiences. They've put a new wrinkle in an old model: the public-private partnership. 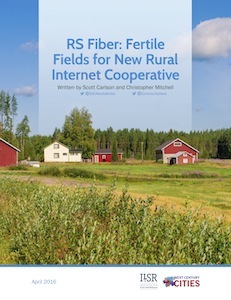 "Communities desperately need better Internet access, but not all local governments are bold enough to 'go it alone'", says Christopher Mitchell with Community Broadband Networks at the Institute for Local Self-Reliance. "Here, we've outlined a few remarkable cities who have demonstrated how smart strategies are helping them help themselves." A city that builds its own fiber and leases it to a trusted partner can negotiate for activities that benefit the public good, like universal access. It may even require (as Westminster, Maryland did) that the partner ISP have real human beings answer the phone to solve a customer's problems. The term "public-private partnership" has been muddied in the past. This report clears up the confusion: public entities and private companies must both have "skin in the game" to balance the risks and amplify the rewards. 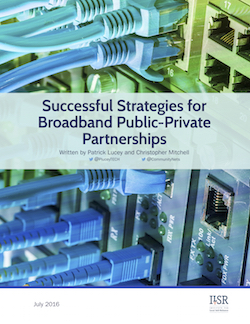 Partnerships in broadband have never been in greater vogue. Communities are realizing they don’t have to build it entirely themselves to get the benefits of gig networks in Chattanooga or Google cities. The report features the revolutionary Westminster/Ting partnership and notes its first copycat: Cruzio and the city of Santa Cruz. These networks are groundbreaking in terms of offering a "third way" for communities to join the ranks of gigabit cities. This report offers a roadmap for cities and outlines the important questions that need to be asked and answered in order to find the right partner with the right priorities for each community. A new trend is emerging in rural communities throughout the United States: Fiber-to-the-Farm. Tired of waiting for high-quality Internet access from big companies, farmers are building it themselves. Communities in and around Minnesota’s rural Sibley County are going from worst to best after building a wireless and fiber-optic cooperative. 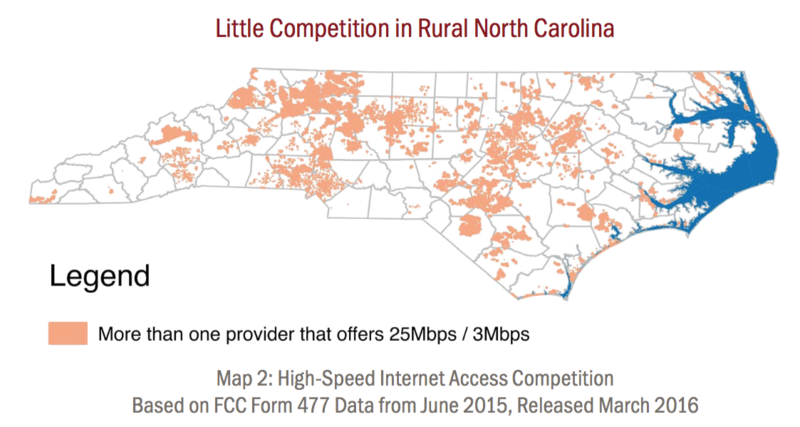 While federal programs throw billions of dollars to deliver last year’s Internet speeds, local programs are building the network of the future. 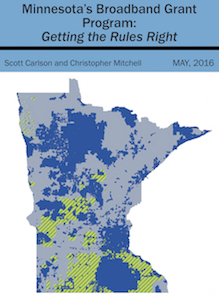 In “RS Fiber: Fertile Fields for New Rural Internet Cooperative,” the Institute for Local Self-Reliance (ILSR) and Next Century Cities documents a groundbreaking new model that’s sprung up in South Central Minnesota that can be replicated all over the nation, in the thousands of cities and counties that have been refused service by big cable and telecom corporations.